getcalc.com's circular cone calculator is an online basic geometry tool to calculate volume, surface area, lateral surface & slant height of a cone shape, in both US customary & metric (SI) units. Cone is a three dimensional plane or geometric shape that generally tapers gradually from the base of circle to the top mid point called the apex. 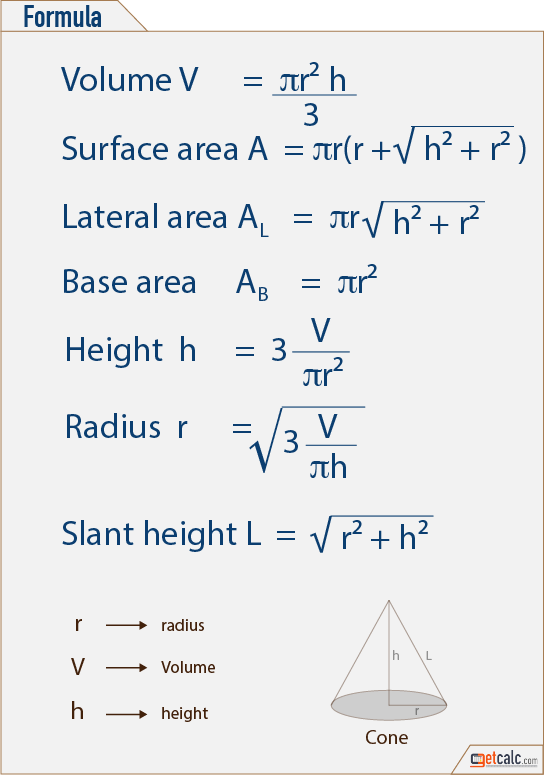 K-12 students may refer the below formulas of cone to know what are all the input parameters are being used to find the volume, surface area, lateral surface and slanting height of cone. Below are the practice problems for grade school students, on finding what is the volume, surface area, slanting height and lateral surface of a cone. By click on the corresponding problem shows the step-by-step calculation or work with steps for how to find the such values of cone. For any other similar values, use this cone calculator to verify the results. The radius & height of a cone measured as 15 inches and 20 inches respectively, find what is the volume, slanting height, lateral surface and the surface area of that cone? The radius of cone is 9 inches and the height is 6 inches, find what is the volume, slanting height, lateral surface and the surface area of that cone?